We are engaged in trading of technically advanced Inlet and Exhaust Valves that are offered in a wide range of material composition such as EN24(BS817M40), 21-4N(BS349S52), EN52(BS401s45), etc. 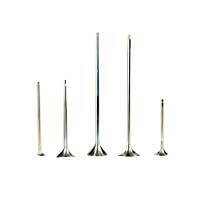 Our Valves are developed by gathering upset forging process. The Bimetallic Valves are friction welded. In addition, we also offer various processes such as Stellite on Seat, Chrome Flash on Stem, and Nitiding/Tuftriding Tip Area.